This week the children have been exploring all different emotions; how they make us feel, how they can effect our behaviour, how they can change and how our emotions can impact those around us. We then linked this to The Easter Story (Holy Week) and dug a little deeper to find out how emotions change throughout the events of the story. The children enjoyed creating their own drama and sharing these with the class. In maths this week it has all been very hands on! The children have been measuring their beans, creating tally charts and bar charts. This led on to interpreting bar charts and comparing data. We brought our project to a close using the story of The Lorax. The children greatly enjoyed the rhyming and creativity of the story. However, they had a strong understanding of the powerful moral behind the story. We must look after the plants and trees in our environment. Here we are at the end of the term already! We would like to wish you all a lovely break. The children have worked very hard all term and thoroughly deserve a long rest. Please remember to keep up with reading, times tables practice and practising telling the time...as well as having some great family time together. The summer term starts on Tuesday 23rd April. We will continue to have PE on Mondays and Wednesdays. Our new project is a history project and will carry on where we left off...the Celts (Iron Age) and then the Romans. This week the children have been creating information leaflets for other children all about how to help plants to thrive at home. Using their knowledge of our cress experiments, the children could really bring their learning to life. They have used their recent writing skills learning to ensure that their leaflets included a variety of sentence types, were written in the present tense and were written in the third person. They also enjoyed adding pictures and diagrams. In maths, the children have been adding and subtracting fractions, ordering fractions and finding equivalent fractions. This work will come in very handy when we have our pizzas next week! Please remember to send in the children's beans on Monday 1st April. We have had quite contrasting results...some are growing very, very well whereas others are yet to start growing! We will be using these next week in our maths lessons and then planting them in our courtyard to continue growing. Exciting news...we wish Mrs Steadman all the best as she starts her maternity leave this week. We are all looking forward to meeting the new arrival. Van Gogh class will now be taught by Miss Siddiqui who is quickly settling into life at Kings Furlong Juniors. This week the children have collected the results from their growing experiments and have made some interesting discoveries about what plants need to thrive. Who knew that the plants in the courtyard would be too cold to grow? Also, it was fascinating comparing the plants that were grown in the cupboard with those on the windowsill. We could clearly see how the plants had elongated to get closer to any light that shone through the door frame...they were long, thin and very pale green in comparison to the strong, healthy plants by the window. The children will be using their findings next week when they create their own leaflets about plant care. In maths the children have been learning about finding fractions of amounts. Next week it will be adding and subtracting fractions as well as finding equivalent fractions. This morning (Friday) we were very proud of the children who represented Year 3 in Kings Furlong's Got Talent! It was a great show and a very tough decision for our judges. A huge thank you to all the children who went for auditions, performed or were judges. You should be very proud of yourselves. We're all a bit red today! It is lovely to see the children getting into the Comic Relief mood! Hopefully we have raised lots of money for a very worthy cause. Thank you for all your contributions. The children have worked extremely hard this week as it has been our assessment week. This helps us to make judgements on where we feel the children are with their learning. They may need a rest this weekend! In project time the children have been learning about the parts of a flowering plant, seed dispersal and germination. Hopefully the beans at home are growing nicely. In art the children are designing and making flower sculptures using wire. What a creative bunch we have! Time flies when you’re having fun! This week has flown by! In English this week, using some interesting settings pictures, the children have been developing their descriptive skills and learning how to use expanded noun phrases. We have been very impressed with the adjectives that the children were able to suggest and use confidently. Towards the end of the week we were using the story of Jack and the Beanstalk to recap speech punctuation skills. We will be using this text next week during our own story writing. In maths the children have been improving their use of number lines to solve more challenging 2digit multiplication problems. The children should now know their 3 and 4 times tables and be getting ready for their 8 times tables. We are finding that quite a few children need some extra times tables practise as they are not practicing their tables enough at home. Please use this week’s home learning sheet to help support your child’s times tables practise. During project time the children have set up an experiment to test the function of the stem of a plant. They have also enjoyed using their watercolour mixing skills to create paintings of flowers. We had a great World Book Day; the children’s costumes were fantastic. Also, today we had a very successful cake sale and managed to raise over £100 for our end of term pizza making party. Thank you for all your support with these events. Welcome back! It sounds like you had lots of fun over half term. Weren't we lucky with the weather? Our new science project, Flower Power, has started this week. The children have been told all about how we will be learning about the parts and functions of plants, where the best places are to grow plants and why, and the importance of plants in our world. They were very excited to hear about our plans to have a pizza party at the end of this half term! They will be growing herbs in school to try out in the pizzas they make. It's going to be an exciting half term! In English this week, the children have been learning about letter writing, in particular persuasive letters. They have a good understanding of some of the techniques people use to be persuasive. Hopefully a letter came home on Friday whereby the children have tried to persuade you to do 2 things for us: please could you donate any pots, soil/compost and herb seeds, also, could you please donate some cakes for our cake sale this Friday? Many thanks in advance if you can. Our cake sale will be in school time on Friday and will hopefully raise some money to help us buy the things we will need for our party. The cakes will be sold for 20p each so the children will need some small change on that day. In maths this week, we have been learning to tell the time. The children have found this quite challenging. It would really help the children if they could practise these skills at home particularly o'clock, half past, quarter past and quarter to in both analogue and digital. We will be moving on to 5 minute intervals too. For their project homework the children have brought home pots and beans. The children know they need to water, look after their plants and record their findings. We look forward to seeing them back in school at the end of the half term. Who's will have grown tall and strong? Well here we are at half term already. Thank you all for coming to our end of project Stone Age museum. It was lovely to see so many of you, especially grandparents. The children thoroughly enjoyed sharing their work with you. We're sure you'll agree, the children have worked very hard since Christmas and deserve a good rest. We hope you have a lovely half term break and look forward to welcoming the new half term on Monday 25th February. Another busy week in Year 3! This week the children have learnt how Stone Age people discovered clay and began to make pottery. The children used the same techniques which we saw at Stonehenge to make their own clay pots. They look great and the children really enjoyed the chance to be creative. In English lessons the children have been exploring poetry techniques. They have written poems using the Stone Age vocabulary that they have learnt. We had great fun writing a class poem which we have performed and recorded using Ipads. You will get a chance to see it soon! In maths, the children have been developing their measuring skills and working confidently in both cm and mm. They were then able to apply this skill when working out the perimeter of shapes. This evening you should have received a handwritten invitation, from your child, to our class Stone Age museum. The museum will be set up in our classrooms on Wednesday 13th February at 2:30pm. The children are really looking forward to sharing their learning with you. Unfortunately, this date clashes with the choir's visit to the Anvil. If your child is in the choir and is going to the Anvil on Wednesday, we will leave the museum set up after school. You are more than welcome to pop into school after 3:15 when you pick your child up. Alternatively, if you are unable to make the museum at 2:30pm, please do pop into school when you pick your child up at hometime. Thanks in advance. Next week we have parents' evenings on both Tuesday and Thursday evenings. We look forward to discussing your child's progress with you. Friday is an INSET day and then we are at half term, already. How time flies! Well, a snow day today! How exciting! We hope the children have had a fun packed day enjoying the snow. We're looking forward hearing all about it on Monday and seeing some of the many snow people who have been made. In school this week, we had a lovely visitor who told the children all about how during The Stone Age, once people moved from being Hunter-Gatherers they became farmers and kept their own animals. The children learnt how wool was taken from the sheep, washed, spun and made into thread ready for making material. During the talk the children had a chance to feel the dirty wool and commented on how greasy it was. Next the children turned their hands to weaving to make their own piece of material, just like the Stone Age people learnt to do. In English lessons, the children applied their diary writing skills to plan and write their diary of our visit to Stonehenge last week. These published diaries will be on show in class during our class museum. The class museums will take place on Wednesday 13th February at 2:30. The children are greatly looking forward to showing you their work. It would be lovely to see lots of you there, if you can, so put the date in your diaries! Hopefully you have received your parents' evenings appointments as these were sent out at the beginning of the week. If not, please pop in and let us know. What a fantastic day we have had today! After a dull, foggy start, we arrived at Stonehenge; the children were very excited to go and see the famous stones. During the day, the sun came out and we had patches of blue sky, although it was very chilly, it was a beautiful day. The children were very well-behaved, a pleasure to take and they thoroughly enjoyed all aspects of the day. The museum was a hit as it held many different artefacts including an actual Stone Age man's skeleton that archaeologists found by Stonehenge. The replica houses gave the children a chance to pretend to be Stone Age people as they explored them inside and out. In one of the houses, a very helpful guide shared all the tools, weapons and clothing that they could have had all those thousands of years ago. And...actually getting up close to the stones was amazing too, as the children could really ponder why it was built and how they carried the stones all the way from Wales. Hopefully the children aren't too tired after a very busy day! Have a lovely weekend. In English this week we have been studying the 'Stone Age Boy', a fantastic story which follows the adventures a young boy has when he accidentally finds himself back in the Stone Age times. The children have enjoyed drama, role playing and hot-seating activities which have really brought the story to life for them. It has given us the opportunity to teach speech marks when punctuating written speech and really develop the children's understanding of new vocabulary. Next week we will be using the text to look at diary writing as if they were the boy. In project time the children have been learning about the importance of cave painting discoveries that date back to the Stone Age. The different animals and how precisely they were drawn has really captured the children's imaginations. In art lessons, the children have used oil pastels to try and create their own cave paintings. Next week we are looking forward to our Stonehenge visit, on Friday 25th January. Happy New Year to you all. We hope you have all had a lovely Christmas break. The children have started the new term with great excitement and enthusiasm. Our new project, The Savvy Stone Age has hooked them in already. On Monday we were out in the school grounds making shelters out of what we could find, just like the Stone Age people did. The children very quickly realised that it must have been a very tough life. Next, the children were using their problem solving skills to try and work out how they moved the stones to build Stonehenge from Wales to Hampshire without any form of modern technology. Again, it must have been tough! We are greatly looking forward to our trip to Stonehenge, you should have received a letter regarding the trip last Monday. In English lessons this week, the children have been learning how to write instruction texts and how to organise the work on their page. This has introduced the children to imperative verbs(bossy verb). Next week we will be starting a book study of The Stone Age boy, a very popular and informative story set during the Stone Age.The children will find out what it could have been like being a child in those times. In Maths lessons the children have been using the bar model to practise their understanding of number bonds. At the end of the week the children were beginning to explore fractions. We will be carrying on with this next week looking at both fractions of shapes and numbers. Our PE lessons on Wednesdays, will continue to be outside this term weather permitting, please make sure your child has a thick tracksuit to wear as it can get very cold. Well, we've made it... a 15 week term has come to an end. The children have worked really hard and thoroughly deserve a good Christmas break. Thank you for coming to our Christmas Market yesterday. The children were very proud and excited to sell their crafts to you. We would like to wish you all a very Merry Christmas and best wishes for the New Year. When we come back in 2019, we will be starting a new history project all about the Stone Age. During the third week of the new term, we will be taking the children to Stonehenge. This will cost less than £5. Thank you all for coming to our Christmas Songs performance on Monday. It was a lovely atmosphere and we're sure you'll agree, it was a superb performance. Well done, children! This week the children have started making their Christmas crafts ready for our Christmas Market. On Thursday our socks transformed into cute Christmas penguins and today we have been learning how to sew; ready to make a tree decoration. During project time the children have been learning about food groups and what it means to have a healthy diet. In English/RE lessons, the children have been exploring their understanding of angels. We have had some very interesting discussions learning about different people's points of view. Maths time this week was spent looking at coins and finding out how to give change...ready for Christmas Market. It's beginning to look a bit like Christmas! Thank you for sending in the children with their Christmas jumpers on Thursday; they all look very festive and jolly! The children did a fantastic job this morning when they showed their Christmas show to the rest of the school. They have worked hard to both learn new songs and develop their performance skills. They are greatly looking forward to performing for you on Monday. We really hope you enjoy the show. During project time this week, the children have been learning about how to look after their teeth. They identified that sweets can be so damaging to teeth, they then used their critical thinking skills to discuss whether sweets should be banned. This led to a very interesting class discussion. Ask your child what they thought...maybe after pudding time! Next week the children will be learning about food groups and how important it is to have a healthy, balanced diet. They will also be using creativity to help them to make their products for our upcoming Christmas Market. You are in for a real treat. Our English work next week will be including our RE unit on Angels. In maths,the children will be revisiting their understanding of money and finding change...ready for market trading! It's been another busy week in Year 3! In our project time the children have been learning about the types and functions of human teeth. They greatly enjoyed using a mirror and looking at their own teeth to identify the shapes of their incisors, premolars and molars. Next week the children will be learning why different animals have different teeth. What would happen if a lion had the same teeth as a sheep? Hopefully your child brought home your tickets for our Christmas songs performance on Thursday evening. If not, please check in their bag! If you haven't ordered yours yet, please do as spaces are being filled quickly. The children are enjoying learning their songs and are looking forward to performing for you. Next week the children will be writing animal stories based on a classic story called 'The Owl who was Afraid of the Dark'. Over the weekend the children have been asked to sketch a picture of the animal they wrote their reports about. They have been told they can just sketch with pencil or add colour using colouring pencils. These will be used when they illustrate their animal stories. We look forward to sharing these with you. Today the children fully enjoyed meeting and holding a variety of exciting predator and prey animals. It was fantastic to be told by our visitors from Zoolab that they were really impressed with the behaviour and questioning of the children. It was a really interesting session. Later today, Mrs Webber came to show us 2 baby hedgehogs which she had found on the school grounds. Unfortunately they wouldn't have survived if left in the wild so Mrs Webber told us all about a nearby hedgehog rescue centre. The children were delighted to see animals that we have been discussing a lot during our animal reports work. During project time the children have been learning how to classify animals: mammals, reptiles, amphibians, birds, fish and insects. ask your child how to work out how animals are classified. We have also been looking at food chains and learning new vocabulary - producer, consumer, predator and prey. The children should be sharing this learning with you in their homework this weekend. Thank you to those of you who have returned the forms regarding tickets for our carol singing show. We will get back to you as soon as we can. If you haven't returned yours yet, please do so we can allocate the times you would like. Thanks. Our new project, All Creatures Great and Small really came to life this week. The children started by exploring human skeletons. They drew around a member of their team and then added in the bones they knew and tried to name them. There are some interesting skeleton drawings hanging in our classrooms! Next the children learnt the actual position and names of key bones. Ask your child why we have skeletons and what are their functions. Later in the week the children used this learning to help them to explore animals that have endoskeletons, exoskeletons and hydrostatic skeletons. In English the children have been using their homework research to write non-chronological reports. These will be published and added to another piece of work which will be shared with you nearer to Christmas. In maths the children have been learning how to use a number line to solve multiplication problems. What a fantastic way to end a thoroughly enjoyable project! It was lovely to welcome so many of you into our classrooms today to share the children's hard work. The children took great pride in telling you all about how the animals helped during WW1. Thank you so much for attending our special service at the end of the day. Next week we will be starting our new project, All Creatures Great and Small. This is a science based project during which the children will be learning about human skeletons, teeth, digestion and food groups. This will also be linked to animals including prey and predator animals, animal classification and food chains. The children have been asked this weekend to choose a British wildlife animal and research its diet, habitat and what is special about it. Have fun! As the weather is getting colder, please could you make sure your child has a warm PE kit including tracksuit trousers and a jumper. Finally, a quick reminder, the children need to be reading at home at least 4 times a week. To encourage this we have a weekly raffle for those who have read enough. This week there were quite a few disappointed children who were not given raffle tickets as they had not completed at least 4 reading entries. Please could you ensure your child is reading regularly at home and you are signing their reading log books. Thank you. It sounds like you all had a lovely Half term break...doesn't time fly? The children have come back refreshed and full of stories about what they have been doing. This week we have started our World War One project, We Will Remember. The children have been inspired by the stories they have heard which show how the animals helped the war effort in so many different ways. We have been focusing on one particular true story called Sergeant Stubby. For their homework the children have been asked to share the story with you and complete a factfile about his bravery. He was quite an amazing dog! Apparently on Sunday at 2.20pm, the BBC are showing the film 'Warhorse' based on the Michael Morpurgo book written about the horses used during World War One. If you haven't already seen it, it is a wonderful film which the children may want to watch some or all of; this would reinforce their learning. Keep a box of tissues handy! In maths the children have been developing their shape knowledge. They have been problem solving using both Venn and Carroll diagrams. Next week they will be looking at angles, symmetry and drawing their own 2D shapes. We are busy practising our songs, preparing our poppies and publishing our work ready for next Friday's project outcome. Hopefully we'll see you there. Have a lovely 'Firework' weekend. This week the children have been planning and writing river based adventure stories using our class novel 'The River Challenge' by Bear Grylls, as a guide. We have been really impressed with their vocabulary choices which have resulted in some great quality writing. The children are developing a better understanding of word types and are able to discuss verbs, nouns, adjectives and adverbs confidently. Ask your child! In maths the children have been interpreting pictograms and bar charts. This week's homework will give the children a chance to show off their skills to you. At the end of the week we were exploring money, identifying the coins we use in the UK and making amounts using the least amount of coins. Next week we will be adding and subtracting money. During project time, the children have been learning about the features of rivers and beginning to use new vocabulary such as meander, tributary, confluence and mouth. 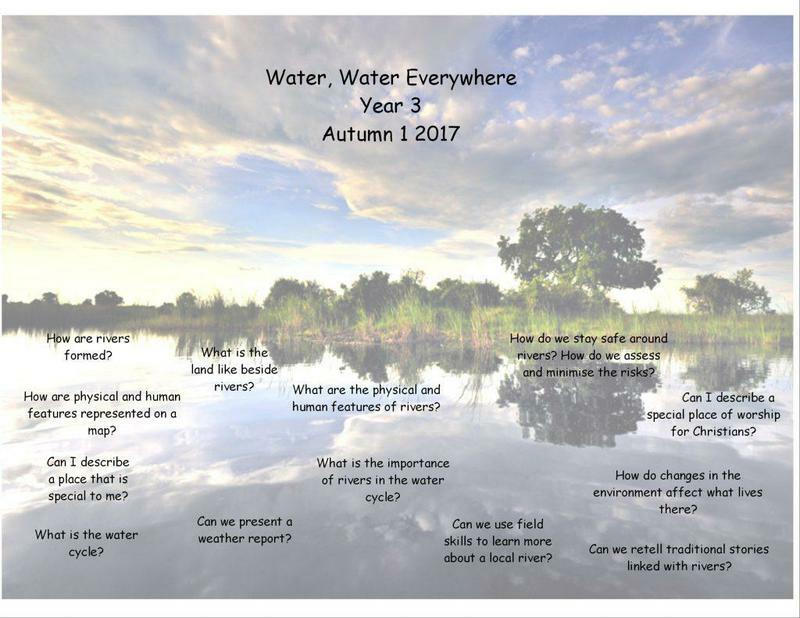 Next week the children will be finishing off their posters and presenting their river information to our Year 4 classes. Next Wednesday, we look forward to going to Eastrop park to learn about the river Loddon. Let's hope the weather is kind to us! We look forward to seeing you all at parents' evenings next week. This week our Go with the Flow project led us into exploring the countries and borders of the UK. The children were asked to draw what they thought the UK looked like; they had some very interesting ideas. Then using UK maps the children labelled the countries and spotted our county, Hampshire. They are now finding out about the names of some of the UK's rivers as we move more into our river studies. The children have a good understanding of the water cycle and a 'helpful' youtube song has helped to remind the children of the key vocabulary - evaporation, condensation and precipitation. On Wednesday the children enjoyed Year 5's Harvest assembly and were told about bringing in food to donate to Foodbank. We are very proud of Monet class who have already brought in 71 items. You still have next week to make your donations. On Thursday it was National Poetry Day. The children explored poems about Autumn and then using their growing understanding of word types - adjectives, verbs, nouns and adverbs - the children wrote their own poems. These are on display in the Year 3 cloakroom. Please pop in and have a read. On Friday both Van Gogh and Monet class had a non-school uniform day as a reward for winning the attendance award so far this term. Well done, keep it up Year 3s. In maths recently the children have been developing their addition and subtraction strategies using number lines. Next week they will be applying these skills using data handling and focusing on pictograms and bar charts. This half-term our topic is 'Go With the Flow'. 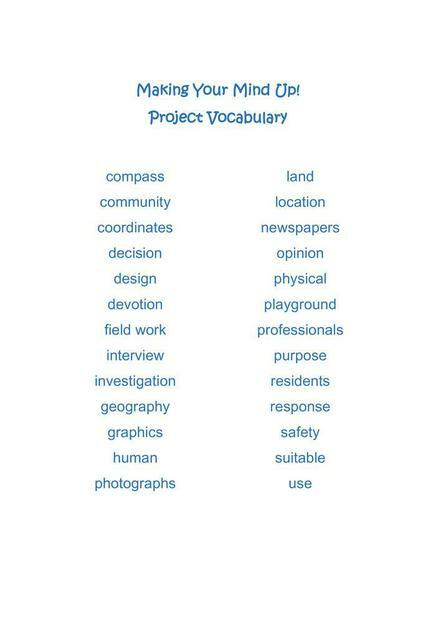 Our topic flyer and vocabulary are shown below. Well, it’s been a busy week! On Tuesday the children enjoyed watching the Year 6 production and were wowed by the performances and singing. The Year 6 team did a great job. The children coped well with the disappointment of the football. It hit us hard as we have been slightly obsessed with football this term. We told each other jokes the next morning to cheer us all up! Many thanks to all of you who came to Year 3’s homemade garden fruits muffin sale. The children thoroughly enjoyed using the fruits that they had grown in our community garden to add to their muffin mixes and make delicious muffins to sell. We hope you also enjoyed the superb packaging that the children created using their 3D nets expertise from our maths lessons earlier in the week. There was a real buzz around the sale as the children couldn’t help but show the pride on their faces. Well done Year 3s. Only a week and a day to go! Enjoy your weekend. For homework this week the children were asked to watch some, if not all, of the England football match. We hope they really enjoyed it! We did! Well done, England. We will be using the match next week to discuss the learning behaviours that the players showed and how we can learn from them, including Gareth Southgate’s management skills! Many thanks for all your support with the stadium homework over the last few weeks. The children created a fantastic display and were very proud sharing their learning with others. This project has really gripped us all. In the community garden the children have been very busy watering and harvesting some of the ripe fruits and vegetables. We will be using the fruits to make muffins which the children will be selling after school. More information about this will be coming soon! The children have enjoyed writing thank you cards for the local companies who supported us. We were very lucky. Next week, taking advantage of the amazing weather, the children will be learning practically about capacity (ml and L). Please could we ask you to send your child in on Monday with a couple of containers that we can use. We hope you all had a great time at the Kings Furlong Summer Fayre on Friday night, it was lovely to see so many of you supporting our fantastic PTA. It looked like the magician was lots of fun! In school this week the children wrote some great letters to our Year 2 children. These will be published and sent to the Year 2s early next week. It was lovely hearing our Year 3s telling us how important these letters were to them last year when they received theirs. In the afternoons the children have been learning new woodwork skills. They are really enjoying measuring and cutting the wood for their marble maze toys. There has also been lots of PE in Year 3. The children’s hockey skills are really improving especially during game-playing. They have coped well with shorter lessons and more shade breaks due to the hot weather. Next week we will be walking to the Kings Furlong roundabout and carrying out a traffic survey to help the children to fully understand about the infrastructure that is needed for a new football ground. They will use the information they find to create tally and bar charts. Tomorrow there is an INSET day in school so we look forward to seeing the children on Tuesday morning. As the weather continues to be so hot, please remind your child to bring in a water bottle and sun hat. Well, the children have worked their socks off this week. It has been English assessment week which has involved reading, spelling, grammar and writing tests. The children have tried their hardest and should be very proud of themselves. We will be using these scores and the whole year’s teacher assessments to check the children’s yearly progress. Next week will be maths assessments involving arithmetic and reasoning skills. During project time the children have been creating paper prototypes for their wooden maze toys and are very excited about starting to make them soon. Thank you for all the research that went on at home about the countries competing in the world cup. This week’s homework is a two week project. We would like the children to find out all about a particular stadium from one of the world cup countries. They are able to present their findings as they choose (3rd July). Hopefully this will get the children thinking about what they would like to include in Basingstoke’s new football grounds. Thank you for completing our surveys about Basingstoke Football Ground. If yours is still at home, please send it back to school as soon as possible. Thanks. Next week it is forecast very warm. Please make sure your child comes to school with a named water bottle. Also, as the children will be taking off their jumpers please check yours are named. We have 20 unclaimed school jumpers in Year 3. If you are missing any please do remind your child to check the boxes. The children have really thrown themselves into our new project. Year 3 is a buzz of excitement. Now the World Cup has started the children are very keen to see how their team does…and England of course! On Wednesday Year 3 walked to the Basingstoke Football ground to carry out fieldwork. It was a fantastic morning full of very excited faces. The children enjoyed measuring the pitch, taking photos, exploring the changing rooms and sitting in the raised seating. Follow up work will involve mapwork to look at the position of the grounds, local roads and routes and the amenities within and around the grounds. The children are already thinking about what they would include in a new football centre, apparently air conditioning is important! Today was Sports Day. It was a great day with lots of healthy competition and fun involving the whole school. It was lovely to see our children shine! Thank you for attending if you could, the children loved seeing you there and sharing their picnics with you. The children will be very tired tonight after a very active and warm day. Apologies for the delay with this week’s blog. Welcome back to our last half term in Year 3! It sounds like you all enjoyed the lovely weather and had some great days out. 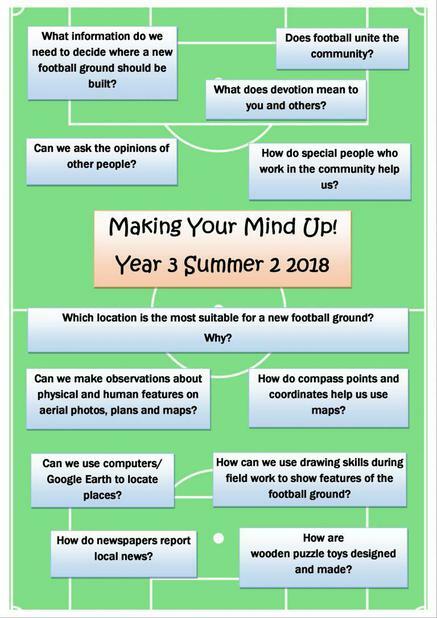 This half term’s project, Making Your Mind Up, is geography based and is linked to the 2018 Football World Cup. The children will be learning all about town planning and focusing on the issue of Basingstoke Football Ground. Our insider has told us that the football ground doesn’t match up to new regulations and therefore will be moving sites. The children will be using maps, identifying possible new locations and discussing possible facilities when finding the football club a new home. This week the children are walking to the ground and meeting a community manager who will be showing the children around the facilities. The children will then have a good insight into why things may need to change. They are very excited about having a good look around! Us too! On Thursdays this half term the children will be having an extra PE session. This will be hockey. Please make sure your child has their PE kit in school all week. They will be sent home on Thursday night, this week, as this Friday it is sports day at school. Please send the children into school wearing their PE kit and coloured T shirts for the whole day. Hopefully we will see lots of you on Friday cheering the children on during their events and races. Well, this half term has flown by! The children have really enjoyed our Flower Power project, especially the transformation of the school community garden. It is looking fabulous. Hopefully we will be able to harvest some tasty foods. The children have worked really hard and deserve a rest. There is no homework set over the holiday however, any times tables practise, time telling practise and reading would be helpful to keep the children ticking over. We wish you all a lovely break and look forward to seeing you all again on Monday 4th June. The weather has been very kind to us and our project this week. The sunshine has meant that we have been able to go out to the garden and plant some seeds, seedlings and flowers. Our Community Garden continues to improve. Well done, children. We could do with a bit of rain now though! At the beginning of the week the children received a letter from a garden centre asking them if they could write a child-friendly leaflet about plant care for their display board. The children rose to the challenge and have enjoyed using their improving understanding of complex sentences to write informative paragraphs for their leaflets. Today, the children have pulled together all of their recent English skills learning to write a letter to Miss Westaway to let her know how our garden project is going. We have used this piece of writing as part of our ongoing assessment and we are very pleased with the standard at which the children are independently writing. In maths the children have used addition and subtraction skills to work with money and find change. During problem solving lessons the children have worked out least amounts of coins needed to make amounts and which amounts they can make if certain coins are removed. Any money practise over the weekend would be helpful. Are the children practising their telling the time skills at home? Time has flown by, next week is our last week before the half term holiday! During next week the children will be exploring the concept of symbolism in RE and learning about the Tree of Life from the Bible. This will then be linked to a famous story, The Three Trees which again has the focus of symbolism. In maths the children will be developing their knowledge of shape, angles and perimeter as they create their own ideal Community garden plan. Enjoy your busy weekend, a royal wedding and the FA cup final. Something for everyone! Year 3 have really enjoyed starting gardening this week; they are really hard workers. If you get a chance, come round to the front of the school and watch as the garden is transformed. This week was generally clearing and preparing the soil. Thank you for sending in seeds for us, and the gardening gloves as there were quite a few stinging nettles. Next week the children will be planting and sowing seeds. If anyone knows of a good child friendly slug and snail repellent please could you let us know. In English the children have been learning all about adverbs (words that describe the verb) e.g. how? silently, where? in the forest and when? after a while. To consolidate the children’s understanding, we have been reading a beautifully illustrated book called The Great Kapok Tree which raises the issue of trees being cut down and animal’s homes being destroyed. This has linked nicely with last week’s work on The Lorax. In maths the children have been developing their understanding of fractions; it’s been quite challenging but the children have shown good resilience. Next week we move on to addition and subtraction with money. If you are out shopping at the weekend, please share any money transactions with your child. Thank you. Today, we had a lovely morning walking to the town library and taking part in some book hunting activities. The children behaved beautifully and answered the librarian’s questions very confidently. Well done Year 3. You are a pleasure to take out. This week the children have been reading the story of the Lorax. They have really enjoyed the rhyming style and have practised choral reading. The story has a very serious point to make which the children feel very strongly about. ‘I am the Lorax and I speak for the trees.’ Using their letter writing skills the children have written complaint letters to the Once-ler asking him to stop cutting down trees. It has definitely given us all something to think about. Please could we ask you to check your child’s jumpers/cardigans as we are collecting quite a few in lost property. Many of the names have washed off. Please check your child has their own and their names are on them. Thank you. As the weather looks to be warming up, please make sure your child has a water bottle in school every. Thank you. Learning can be very thirsty work! We wish you all a lovely bank holiday and will see you on Tuesday. Well, our new project has really inspired our children already! Due to the new car park being built last year and the qube classrooms being added, the community garden has somewhat been forgotten. Having been to look at our tired and overgrown community garden, the children are very keen to get started improving it. The children will be using this task to support their learning about plants and flowers in our Flower Power project. In English lessons, the children have been learning about writing letters and grouping their information to form paragraphs. After writing to Miss Westaway to ask for permission to carry out this project, the children have written to local supermarkets and garden centres to ask for donations. We are eagerly awaiting their replies. In maths the children have been securing their division methods and answering worded problems. Next week we will be developing fractions understanding. You could support this at home by asking the children to halve numbers below 100. The children are becoming a lot more confident with their times tables, keep up the practising at any opportunity…walking to school, while driving in the car. Thanks. Next week we will be visiting the town library, the Discovery Centre, on Friday morning to help the children to understand the Dewey System. The children will be playing games and searching for authors. We would like to wish you all a lovely Easter break. The children have worked very hard this half term and fully deserve a rest! We look forward to hearing all about their adventures when they return. During the first week back the children will receive a letter from a Roman General who needs some help making the shelters dark enough for the Roman soldiers to sleep comfortably during the summer. As you may have guessed, we will be learning all about light. Please could you send your child back on that Monday morning with a torch in their bag so that we can carry out lots of scientific experiments. Many thanks. What a difference a week makes! After a very snowy start on Monday morning, this afternoon, while most of us were on the field, felt positively like springtime. The children thoroughly enjoyed trying out different sports with children from other year groups while raising money for Sports Relief; it was a very active and fun afternoon and hopefully we have raised lots of money for a worthy cause. On Wednesday we had a fantastic music concert from Hampshire Music, the children were taught all about string instruments and enjoyed listening to some classical pieces. After learning a few songs, the children participated well and sounded beautiful. Once again, we were proud of their wonderful behaviour while we had visitors in. Thank you to the parents who attended our maths morning today. The children really enjoyed sharing their Roman Numerals learning with you. If you were unable to attend and have any questions about how maths is taught in our school please don’t hesitate to ask. Next week we have the cake sale on Monday, the Easter egg hunt on Tuesday and the last day of this term on Wednesday. This half term has really flown by, hasn’t it? This week has been assessment week in Year 3. The children have worked really hard and approached each test in a very sensible way. They should feel proud of themselves as we have seen them all try their very best. Well done Year 3s. These assessment results will be reported to you in the same way as they were at the end of the first term. The powerful Roman army was our focus this week. The research the children did about Roman soldiers for their homework was very useful and helped the children to really understand how hard life as a soldier must have been. In English lessons, the children used video clips and books to help them to take notes about the weapons the soldiers had, their advanced fighting formations and what they did in their leisure time. Using these notes the children then wrote their own report. They really are becoming experts. For homework this weekend, the children are making Roman Numeral clocks. These will be used in lesson time next week to help develop their understanding of Roman Numerals and their time telling skills. Please practise telling the time with your child at home…if you get time! We were really impressed with the children’s thoughtful and knowledgeable answers to the Butser staff’s questions. As always we were very proud of their impeccable behaviour and respect for others. It was wonderful to be told by the staff at Butser that our children were one of the best groups they had ever had. Well done Year 3. Welcome back. It sounds like you’ve had a busy half term! The children told us all about the exciting things you were doing over the week. Well, here we are in our 4th half term, over halfway through the year! The Romans are invading… The children have really enjoyed the start of our new project, The Rampaging Romans, and are very enthusiastic about their new learning. On Monday we kicked off with creativity. After looking at some of the amazing mosaics that the Romans left behind, the children created their own. These are on display both in the classrooms and in the cloakroom. Using atlases the children have identified where the Roman Empire began and how it spread over 48 different countries. Next week we will be looking into why the Romans came to Britain. In English lessons the children have begun a new class novel, ‘I was there…Boudicca’s Army’. We will be using this fantastic historical story to help cover English skills alongside their new Roman knowledge. This week the children have been developing their understanding of complex sentences – using conjunctions and subordinate clauses. We will be continuing with this next week too. In maths the children have been developing their subtracting methods. We were very pleased with the progress the children made over the week; it was a pleasure to watch their confidence grow. Next week we will be recapping properties of 2D shapes and learning about perimeter and how to measure it. Next week we look forward to seeing you at Parents’ Evenings on Monday or Wednesday. Another busy week in Year 3! On Monday Zoolab arrived with bags, boxes and containers full of some very unusual creatures. The children greatly enjoyed the chance to hold and feel a giant snail, a large…very large hissing cockroach, a corn snake, a rat and an enormous millipede. This led our week into learning about food chains and the vocabulary around them e.g. producers, consumers, prey and predators. There is a great game the children can play on the BBC Bitesize website which asks the children to explore food chains in different habitats. In English lessons the children have worked very hard to write their own animal adventure stories. The skills they have been developing include accurate punctuation, prepositions, similes, adverbs (ly words) and writing direct speech. They have worked extremely hard and are very excited about publishing these next week with their watercolour illustrations. The homework this weekend is to create their own book cover. In maths the children have been developing their addition methods including an expanded column method. Ask your child which method they would use to add; they are very really improving how they discuss their thinking and methods. Next week the children will be learning how to measure accurately and will be using their addition methods to add lengths using millimetres. Hopefully you have received the parents’ evening letter. Please complete yours and return it ASAP, as appointments are filling up quickly. Another busy week…this week the children have really enjoyed reading The Owl who is Afraid of the Dark. We have picked out themes that are similar in each chapter which helps us to work out what we think will happen next. The children have been learning the importance of adverbs within narrative texts, in particular, ly ending words and how they can really improve how a reader can visualise things in their mind’s eye e.g The boy miserably ate his snack. The boy happily ate his snack. Using this story, the children have chosen their own animal that they will be using next week to write a story following the same theme. Over the last few days the children have worked hard to use powerful adjectives, similes and prepositions to describe their characters. They are looking forward to planning their own stories and over the weekend are thinking about what their animal could be afraid of. In maths the children have been learning to tell the time. This has also included solving time duration problems. The children would really benefit from practising their clock reading skills with you. Next week we are greatly looking forward to our visit from Zoolab. This will lead the children into their next part of project work which will be food chains. Well, it’s been a very cold week hasn’t it? The snow caused a lot of excitement in Year 3. What a shame there wasn’t enough for making snowmen! During the week the children moved on with their project work from teeth to the digestive system. They had some very creative ideas about what they thought was inside us and what happened to our food! Next week we will be focusing on food groups, nutrition and healthy eating. Please help to remind your child to complete their food diary over the weekend. We would like to use this information during project lessons on Monday afternoon. In English the children have continued on the theme of persuasion and have written to try to persuade our PTA that sweets during a disco are a good idea. In skills lessons the children have been learning about apostrophes with the focus on possession e.g.Tom’s coat is blue. Next week we will be starting a class novel ‘The Owl who was Afraid of the Dark’. Our focus will be character descriptions, planning and writing our own animal stories. Our skills focus will be adverbs, particularly ly ending words e.g. slowly, happily. In maths the children have been deepening their understanding of fractions including fractions of amounts e.g 1/3 of 24. Next week we will be looking at time. It would really benefit the children if you could practise telling the time at home. The children are allowed to wear watches to school so if they have one please could they wear them next week. Finally, please could we apologise for the spelling confusion in Monet yesterday. The children have been sent home today with their actual spelling list. It may differ from the one in their homework books. Please could they learn the ones they were sent home with today which uses apostrophes for possession. Phew, that was a busy week! The children started the week learning all about homophones (two words that sound the same but are spelt differently) for example allowed and aloud. Please could you practise the list with your child at home as they will need to know the meanings and the spellings for next Tuesday’s test. You may have noticed that your child has become quite good at persuading you recently! In English lessons, we have been looking at persuasive texts and the techniques that are used. Rhetorical questions and powerful adjectives have been our targets so far. We will be continuing this work next week including exaggerating and flattery…sorry! In maths the children have been developing their understanding of fractions. We will be looking at fractions of amounts next week. If you could practice halving at home it would be very useful e.g half of 28 is 14. In project time the children have been learning about the types and functions of both human and animal teeth. This has led on to work about mouth hygiene. The children tell us they are experts at cleaning their teeth! Next Wednesday we will be having a dental nurse coming to talk to the children. The children will then be writing persuasive letters to younger children about keeping their teeth clean. Finally, this afternoon we had an absolutely brilliant pantomime to watch. The children loved it! They were captured by the fun, music and dancing. See what we mean by a busy week! Happy New Year to you all. We hope you all had a lovely Christmas and enjoyed the holidays. Many thanks for all the lovely Christmas gifts and cards we received. Thank you for thinking of us, we really appreciated it. Off we go with the Spring term…ready for new learning. To hook the children into our new project ‘All Creatures Great and Small’, they were set a challenge…to work in pairs, research an animal they are interested in and produce a piece of work ready to share with others. They jumped at the task with great curiosity and enthusiasm! After asking questions about their animal, carrying out research using websites, making notes and then presenting their work in a written form, this afternoon the children shared their work in their own class and with the other Year 3 class. It was a pleasure watching the children learning from each other and there was a real buzz of excitement in the air. Well done Year 3, you have made it a delight to come back to school. This term PE will continue to be on Tuesdays and Wednesdays. Please make sure your child has their PE kit in school. We will be starting our usual reading expectation of 4 times a week today so please remember to sign your child’s reading log. Thank you. Have a great weekend, keep warm! Many thanks to all the Year 3 children who took part in this year’s fantastic pantomime and a huge thank you to all the parents who came to watch. We were very proud of you all. It was a brilliant show. Our theme for this week was angels. The children have shared their pictures, thoughts and feelings about angels. They have investigated the important role of the angels in the Christmas story; we enjoyed watching some of the children’s acting as they performed particular Nativity scenes to show the messages the angels brought. Together we have read some lovely picture books about angels which have a powerful message of love, friendship and thinking of others at this special time. The children have now started making the crafts that they will be selling at the Christmas Market. Year 3 will continue with our R.E. theme of angels. Today there were sewing skills to learn and salt dough ornaments to create. We are looking forward to next week already! What a fantastic way to finish our Savvy Stone Age project! Many thanks to all of you who attended our class museum; it was a great turnout. Although slightly nervous to start, the children were delighted to see so many of you. We hope you enjoyed completing our Stone Age quiz as the children were very proud to share their knowledge with you. The next 2 weeks will have an RE theme linked to Christmas. The children will be exploring angels and their place within the Christmas story. For our Christmas market (Wednesday 20th December) the children will be learning how to sew and making angel tree decorations. If you are able to come into school on Thursday 14th or Friday 15th in the afternoon next week to help the children with their sewing, you would be very welcome. Please come and speak to us or drop a message into your child’s home/school book. Thank you. This week started with a visit from Mrs Sharpe, who told us all about how people from the New Stone Age began to use wool from the sheep that they farmed. She showed us an actual sheep’s fleece, how it was washed, spun and then weaved into a fabric for making clothes and blankets. The children then turned their hands to weaving and made their own fabric later in the week. Our next visitor was Mrs Hewitt, who showed the children actual flint tools and antler knives that a friend of hers, who takes part in reenactments, uses. She had some amazing facts to share about prehistoric paper made from bark and medicines made from herbs. Aren’t we lucky to have such experts within our staff? The children have finished their Stone Age reports and are in the process of publishing their work. These will be available for you to see…along with lots of other artefacts…at our class museums next Friday. We look forward to seeing as many of you as possible. This week the children have been carrying out end of phase assessments in maths. Along with teacher assessments, these help us to decide on the children’s attainment for the term. Next week the children will be having reading, spelling and grammar(SPAG) and writing assessments. Please could we remind you to add named jumpers and tracksuit bottoms to your child’s P.E kit as the weather is very cold at the moment. Thank you. It was road Safety week this week. The children have been discussing and acting out mini plays to remind themselves of the safest way to cross roads. From this they wrote a set of instructions that we should all follow. For their homework they are creating powerful posters based on this year’s theme of telling drivers to slow down. We look forward to seeing these. We would like to invite you to our Stone Age class museums on Friday 8th November from 8:45 to 9:30. The children are creating their own invitations using the computers but we seem to have clashed with the new school laptops being set up so there has been a slight delay! The museums will be a great chance for you to see all the hard work and learning that has taken place within this project. Another busy week in Year 3! The ‘Stone Age boy’ book, has been thoroughly enjoyed by the children this week; it has inspired them to write descriptive diaries about his exciting adventures. We have been very pleased with both the increase in the children’s stamina with their writing and their growing use of powerful vocabulary. Well done, Year 3s! In project time, the children have worked in groups to create cave paintings on large, vertical boards (to mimic being in a cave). They have also explored Stone Age pottery and have enjoyed creating their own pots using a grooved ware style. Next week we will be moving into the next stage of the Stone Age when farming first began. Today the children had a fantastic morning at the cinema watching Cars 3. Their behaviour was brilliant as always and they were a pleasure to be with. We all particularly enjoyed the new plush reclining seats! Many thanks for your support with Children In Need yesterday. Using the fantastic picture book, Stone Age Boy by Satoshi Kitamura, the children have travelled back 15,000 years to find out out what life may have been like for Stone Age people. The main character, a modern day boy, finds himself suddenly in a very different world. After discussing the beautiful illustrations, the children have developed their vocabulary and understanding of prepositions to write powerful descriptions of a Stone Age settlement. We will be continuing with this book next week to help the children to write diary entries as if they were there! In maths this week we have focused on the use of number lines to multiply. Next week we will be using money in problem solving. If you could share some coins with your child this weekend, discuss their value and practise counting coins this will set them up well. Next week we have Children In Need on Thursday 16th November. The children have been asked to come to school in non school uniform for a donation of 50p. Please could we also ask you to send in some cakes for our bake sale at break time. There will be a toy sale and a lucky dip for a small amount of money. Finally, on Friday we will be going to the cinema. Please remember to send a packed lunch with your child as they will be too late for a school lunch. This week we have started our new project; The Savvy Stone Age. On Monday, the children were presented with a brick and were asked to move it across the desk using whatever they could find in the classroom. Pretty soon they had worked out they could roll it using pencils. This then led into a discussion about how Stone Age man could have moved the stones from Wales to Hampshire to create Stonehenge. Later on in the week, to help the children to understand just how long ago the Stone Age was, we all went into the hall and used a very long time line to plot out time! It was established that it was a very, very long time ago! Today the children have had a fantastic and somewhat foggy day at Stonehenge! They had a close up look at the stones, explored replica Stone Age houses and enjoyed looking at many actual artefacts in the museum. They were a pleasure to take, showed great Kings Furlong Learning behaviours and are probably very tired tonight. We are! Next week the children will have their flu sprays on Tuesday and it is ‘photo day’ on Wednesday. If your child is in Blue Team they have a non uniform day on Monday. Please could we remind you to ensure your child has their P.E kit in school next week as this week quite a few children missed out on their P.E lessons due to not having kit. Also, please could we ask you to make sure your child has their name on their belongings especially jumpers and coats that are often removed during the school day. We have had a few jumpers with names that have washed off. On Tuesday, this week, Year 3 children had a fantastic afternoon in Eastrop park rounding off their Water, Water Everywhere project. They explored the River Loddon and thoroughly enjoyed floating their ‘water vessels’. As usual their behaviour was exemplary. Thank you to those parents who came with us. Those last 7 weeks have flown by, we are at the half term already! 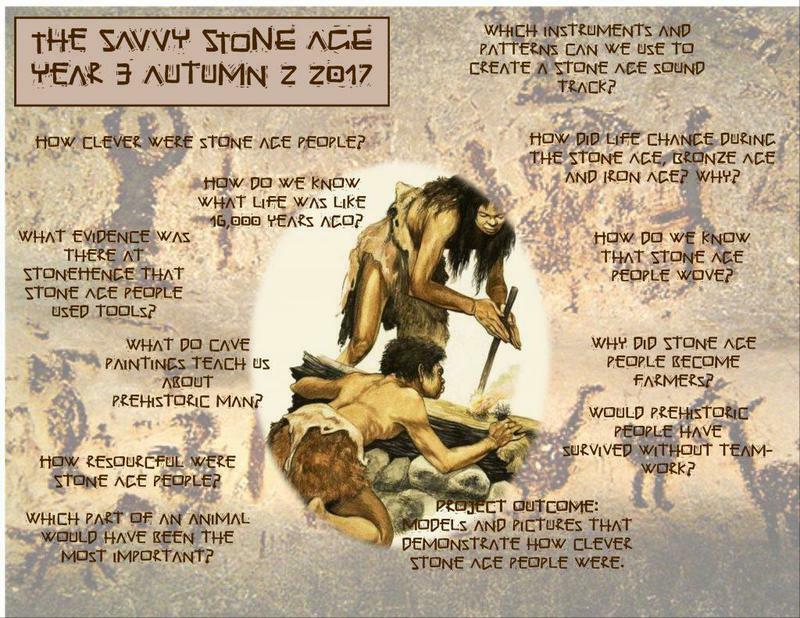 We are extremely pleased with how the children have settled into the junior school and look forward to starting our next project with them, The Savvy Stone Age. We wish you all a lovely half term break. It was obvious that lots of you were practising the river poem at home last week as the children recited their verses beautifully. Thank you. The children then picked out the verbs and used a thesaurus to find synonyms for them. In maths the children have been learning about the properties of 2D shapes and we look forward to seeing the posters they are making for homework. Friday was colour team challenge. Hopefully your child has shared their experience with you. We were really pleased to see teamwork, a key learning behaviour, in action. Next week we have P.E on Monday and Wednesday. Please ensure your child has their P.E kit in school on those days. We are greatly looking forward to going to Eastrop Park on Tuesday. This will bring together all our project work this half term. If you have a current DBS and would like to come with us to the park, you are more than welcome. Please pop into school and let us know. A quick reminder, it is INSET day on Friday. Our theme for this week was Special Places. Many thanks for completing last week’s homework with your child as your thoughts about places that are special gave us lots to think about. The children used their senses to help them to write descriptions of how and why certain places are special to them. The children then explored the concept of sacred and watched clips about what makes Hindu places of worship sacred. On Friday we had a lovely morning visiting St. Michael’s church and learning how churches are sacred places for christians. The children were extremely respectful in both their behaviour and questioning while we explored the church. In project time the children have been working in groups to create informative posters about the features of rivers which they will be sharing with our Year 4 children soon. Next Friday will be our colour team challenge morning. If you have any spare newspapers, please send it into school as we need quite a lot for our challenge. Please could we ask you to check that your child’s name is still easy to see on their jumpers as we are beginning to get a collection of jumpers left behind with no clear names on. Thanks. Gosh, has it been a month back at school already! Time is definitely flying. During project work this week, the children learnt about the physical and human features on a map including the local rivers. This led on to learning about the water cycle and the role rivers play within it. We apologise for the annoying song the children learnt called the water cycle rap. They have been humming it a lot! In English, the children started the week by showing off their knowledge of adjectives and similes when they wrote descriptions of the characters they created last week. Next, they planned stories about these characters and finished the week by writing their stories. They have been a pleasure to read. In maths the children applied their addition strategies with problem solving activities and have now moved on to subtraction methods. We will be continuing with this next week. It was lovely to see so many of you at our reading workshop on Wednesday and the children enjoyed welcoming you into class. Thank you for your parents’ evening replies we will be confirming your appointment times next week. This week the children have learnt to retell the story of The Gingerbread Man. This text was then compared with last week’s story; to help the children to identify the features of stories. The children then explored what makes a sentence and the different sentence types. By the end of the week the children had created their own characters for character descriptions and story plans to be written next week. In maths, the children have been developing addition methods which they will apply at the beginning of next week before we move on to subtraction. This week’s homework involves a maths investigation which we will look at together on Tuesday and discuss approaches to logical thinking. Our project work has really taken off this week. The children have explored OS maps and the symbols that are used. The children then used a map of the school grounds to create their own symbols. Our school nurse visited this week and talked to the children about the upcoming flu spray. A letter will be coming home regarding this soon. It has been a great week in Year 3! The children have really enjoyed retelling the story of The 3 Billy Goats Gruff and being creative with their actions. We hope you are enjoying those at home with the children while they complete their homework. In English lessons, we have used the story to focus on adjectives; the children have finished the week by writing powerful descriptions of the troll’s home. They have really impressed us with their lovely choice of vocabulary. In maths we have been exploring place value. Next week we will be looking at addition methods and problem solving. Also, next week we will be holding our elections to find school councillors. If your child would like to be a candidate they will need to make a short speech to the class. They might want to practise these with you at home. What a fantastic start to the new school year! Our new Year 3 pupils are a lovely group of children and have settled very quickly into the routines of Junior School life. We are very proud of how smart they look and how keen they are to be doing the right thing. This week the children have been carrying out a book study about a dog who learns what it means to be a friend, ‘No Room For Napoleon’. They have discussed the characters’ actions, predicted what they think should happen next and made up rules for how to be a friend. From this they are creating their own classroom charters. This term P.E will be on Tuesdays and Wednesdays. We recommend that the children bring in their P.E kit on a Monday and take it home on a Friday, as sometimes we get the opportunity to do extra P.E sessions also the children may choose to take part in after school clubs that need a P.E. kit. Thank you for all the labelling of clothes that you have been doing. It has been very easy returning jumpers at the end of the day! Well, it’s been another scorcher! The children have coped well with the heat, much better than us! On Tuesday the whole school, in quite a long line, walked to the Anvil to take part in the Primary Prom. The children made us very proud due to their fantastic behaviour and great participation with the singing. If your child was inspired to take up a new instrument, we do have a music teacher that visits our school to do lessons, please ask at the office. The children have been very reflective this week and have enjoyed writing their own end of term reports which will be added to their main reports that you will receive next week. We showed the children all 3 of their project books from this year and it was brilliant watching them sift through them and see for themselves how far they have come. Today was move up day at Kings Furlong, which the children greatly enjoyed. They came back to us this afternoon full of excitement about their new classes and the activities they had taken part in. Apologies for the date mix up on the homework slips. Homework is due in as normal on Tuesday. This is the last homework that will be set this year. 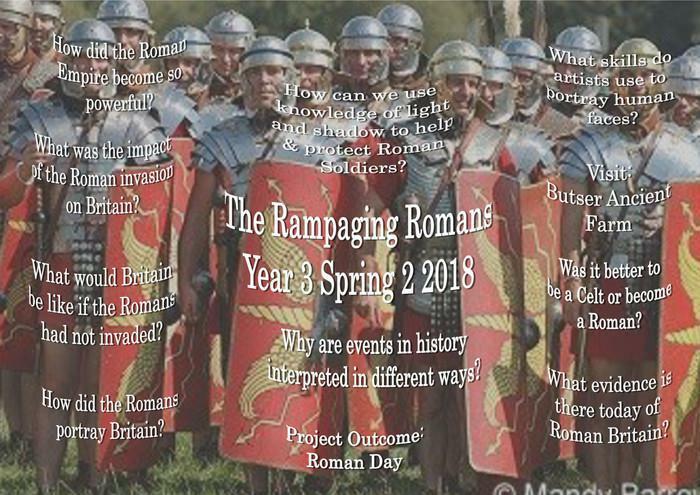 On Monday it is Roman Day for Year 3. It is going to be a very action packed, fun day. We are all greatly looking forward to it.